We invite you and your company to support Vulcan Snow Park through a sponsorship or participate as an exhibitor. Partnering with us will bring your company exposure to about 100,000 visitors over the 10 days of the Saint Paul Winter Carnival and make this fun, family-friendly event possible. ​We have many opportunities for cash and in-kind sponsorships and a limited number of vendor/exhibitor spaces. 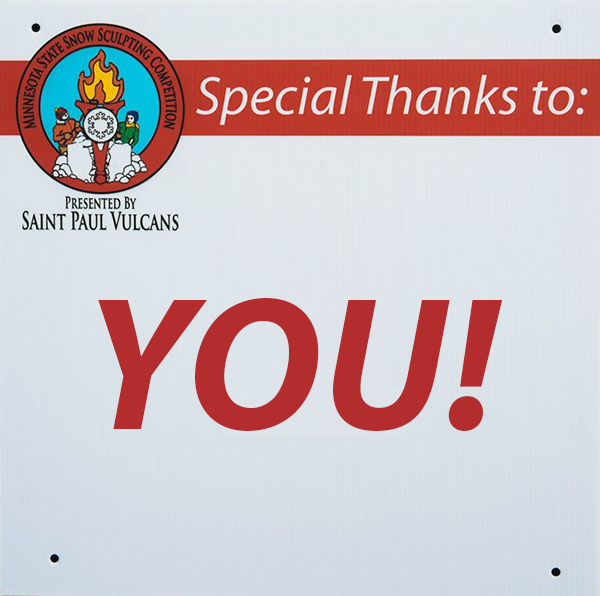 And Vulcan Community Charities is a 501(c)(3) charity, so your sponsorship donation is tax deductible as allowed by law. Please contact us to discuss the best package for you. Cash sponsorships contribute to the operating costs of Vulcan Snow Park and its events and activities. To keep Vulcan Snow Park free to the public, we rely on in-kind donations for everything from food and beverage to equipment and sanitation services. Please consider whether you can provide any goods or services we might use (such as those listed in our partner prospectus) and contact us to discuss the best in-kind arrangement for you. ​In-kind donors receive the same benefits as cash sponsorships of the same level. Businesses have the opportunity to display their products to thousands of Vulcan Snow Park visitors.